Two Schoharie residents with significant positions in local government were arrested over the past twenty-four hours as part of a New York State Police investigation. Investigators based out of the Latham Troop G barracks arrested Benjamin Cooper, age 45, on multiple felonies on Thursday, January 3rd. Mr. Cooper, who is a Public Works Administrator in the Schoharie County Department of Public Works, was charged with Criminal Possession of Stolen Property 4th Degree, Falsifying Business Records 1st Degree, and Conspiracy 5th Degree, with the last of the charges being a misdemeanor. Additionally, James P. Schultz was arrested on the morning of Friday, January 4th, when he surrendered himself to State Police. Mr. Schultz, age 37, is a member of the Schoharie Town Board and he was charged with Conspiracy 5th Degree. According to a press release issued by the State Police, the arrests stem from an investigation which began after a former tenant of Mr. Schultz reported that his vehicle was missing to the Schoharie County Sheriff's Office. After further investigation, the vehicle was located in a local scrap metal yard in the City of Albany. The Schoharie County Sheriff's Office turned the case over to the New York State Police Investigators in Latham. Both men were issued appearance tickets to appear in the City of Albany Court on Thursday, January 17th, 2019. Mr. Cooper, whose son Cody serves on the Schoharie Town Board alongside Mr. Schultz, was named the 2018 Schoharie County Republican of the Year in May. NY. Any other town business which comes before the board will also be discussed. 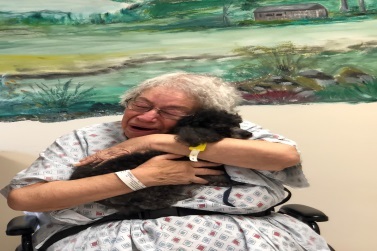 hospitals and wherever else therapy dogs are needed. Keyser visits with her Doberman pinscher, Elle; and Suzanne Vortkamp visits with her German shepherd Chester. In this Friday's edition of the Mountain Eagle. I’m not going to spill a lot of ink refuting the Governor’s first statement, even though it’s one that I fervently disagree with. There’s plenty of state and national writers that could do so better than I could. However, I would like to talk about the context of the Governor’s flubs. We don’t write a lot about national politics but Governor Cuomo has made it a point to be a prominent figure in our entire coverage area. Governor Cuomo’s statement doesn’t make sense. However, it makes perfect sense that he would say it. Andrew Cuomo is the embodiment of why America is great. Not because of his actions, but because of how the country has treated his family. His father Mario was born to two Italian immigrants and grew up in Queens. He went to public school, then St. John's Law, and played in minor league baseball. In one generation, the United States took a poor son of immigrants, sent him to a private law school, made him governor, considered by Bill Clinton for the Supreme Court, and allowed him to flirt with the presidency several times. Andrew grew up in the shadow of his father's political rise, attending the private Fordham University and Albany Law School. He founded a charity for the homeless, married (and divorced) the niece of President Kennedy (and daughter of Senator and likely-future-president Robert F. Kennedy), served as Secretary of Housing and Urban Development, NYS Attorney General, and now may win a third term as Governor. His brother is a prominent CNN anchor. What other nation would allow such a rapid rise? For all of America’s faults, it provided the crucial backdrop for political success that Andrew Cuomo does not appreciate. He is a child of privilege and his 2018 statements are far from his immigrant grandparents’ small shop in Jamaica, Queens. His father used a similar line of thinking in his keynote address supporting Walter Mondale in the 1984 Democratic National Convention. He jabbed at Ronald Reagan: “Mr. President you ought to know that this nation is more a "Tale of Two Cities" than it is just a "Shining City on a Hill.” The speech did as little good for Mondale as Andrew’s did last week. President Reagan carried 49 states compared to Mondale’s 1. Politicians triangulate and pander from local boards to state houses and DC. That’s nothing new. It’s the cold political calculus that makes Governor Cuomo different. America is great-- and the Governor should start taking notes instead of potshots he thinks will get him applause. Cobleskill, N.Y. – The North Eastern Athletic Conference (NEAC) announced today that 43 SUNY Cobleskill student-athletes have been selected as recipients of the league's Scholar-Athlete Awards for the 2017-18 academic year. In order to be eligible for the award, recipients most have earned a 3.40 grade point average (GPA) or higher during the academic year. For the 2017-18 academic year, 890 student-athletes from the league's 14 full-member institutions and six associate member institutions received NEAC Scholar-Athlete honors representing 36 states, Puerto Rico and 15 different countries. During the 2017-17, the 318 student-athletes in the Fighting Tigers program posted an overall GPA of 2.75 with 147 student-athletes earning over a 3.0 GPA for the year. This marks the most NEAC Scholar-Athlete Award honorees in program history since Cobleskill joined the conference in 2008. "I am proud of our student-athletes for their efforts in the classroom and on the field of play," said SUNY Cobleskill Director of Athletics Marie Curran-Headley. “I am also proud of the direction and efforts our coaching staff has taken in finding and recruiting quality young people who are capable of such impressive success at the NCAA level of competition"
Hurt in an accident? Search Ehline Law Firm Personal Injury Attorneys, APLC for great info on getting money.